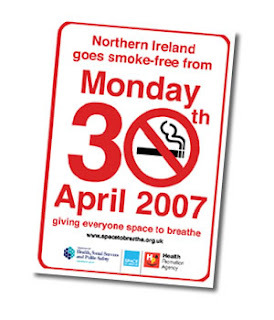 In 9 days time Northern Ireland goes smoke free in all public places, including bars & restaurants even company cars!. This is a fantastic and exciting time. I am not anti-smoking but firmly believe that no-one should be subjected to secondary smoke simply because of their job. For me this is a Health and Safety issue and it is long overdue. It brings Northern Ireland into line with the rest of Ireland and is simply wonderful. The downside is the smells which the smoke used to hide, especially after a few pints of dodgy Guinness or some peoples indifference to soap and water. But a bad smell never killed anyone. So for once I say congratulations Paul Goggins and Peter Hain. The rest of the UK has taken similar steps, Scotland a year ago, Wales this month and England in July.